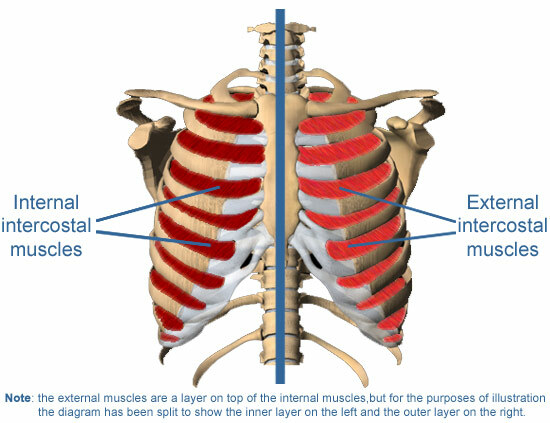 In the preparation leading up to my last fight, I had done some damage to what I then thought was my scapular muscles (the ones nestled in behind your shoulder blades). It wasn’t anything serious but it was enough to stop me from being able to clinch the week before my fight. It was no surprise to me that my fight was a tough one and involved a lot of clinching, which unfortunately was my undoing. I felt a tear and searing pain in the later rounds but was fuelled by adrenaline and continued on. When I woke the next morning, not only was I in agonising pain, I was also unable to hold my head up or straight. I was walking around with my head titled to the left and down, much to my friends amusement. I was being stubborn thinking it was just an awful knot and it would go away but alas, I managed to cripple myself in my sleep the next night only to make things worse. One of the major pitfalls of where I am living, is the quality of medical care and treatment and the availability (or rather lack there of) of someone who can accurately diagnose you and further, treat you. I went to my “magic man” who took one look at me and his face said it all. It took 3 painful sessions, 3 days back to back, to get me to a point where I could lift my head and hold it there. I couldn’t lie on my back in bed, lying on my side caused searing pain. Needless to say, sleep was a big problem for a while. When Caley arrived and I spoke with her about my symptoms, she explained to me that she has had the EXACT same thing – damaged intercostal. Usually a 6 to 8 week injury. It was quite possibly the worst thing I could have heard at the point. I was on a 6 fight win streak and didn’t want to lose momentum. I was so determined to not lose my fitness that I was back at the gym doing anything I could manage. Caley was great and helped me build circuits that didn’t do further damage to me or hurt me. A month later I was back in the gym, boxing pain free. After a week of hard boxing, then reinstating my kicks, I was finally scheduled to fight again on the 3rd September. Training went into fight mode, and so did I. The week before my fight I was told, don’t worry, you fight on the 5th now. The week of the 5th – sorry – your fight has been moved to the 14th. Boooooooo. 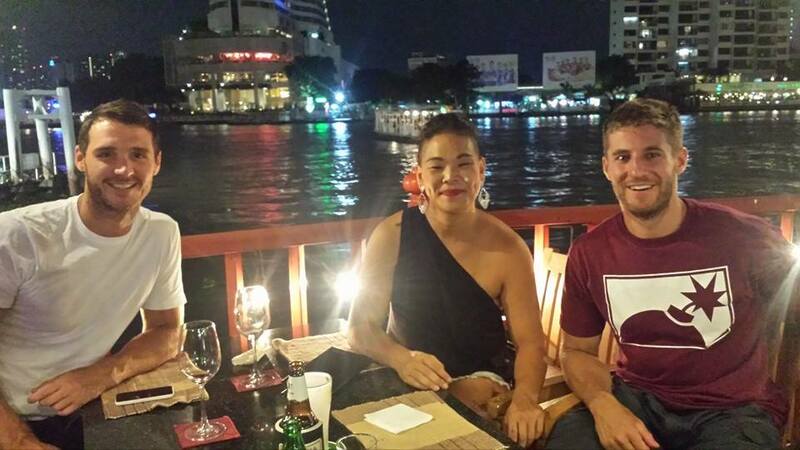 I had made plans to travel to Bangkok the day after my fight – I had met some really nice Aussie lads here at Sinbi who were going to Bangkok on their way home and I had somehow managed to crash their weekend. Lucky they didn’t seem to mind. I was so disappointed because I had been wanting to go to Lumpinee for the longest time and knew it would be better to go with friends and not on my own. When I spoke with Sing (the boss), I had said to him that I really wanted to go, not only to see the fellas off but to watch a show at Lumpinee. To my surprise, Sing says to me, “Yes. You can go. But you have to go to Lumpinee on the Friday night, not the Saturday”. I was confused, and felt somewhat trapped (for those of you who know our boss). The conversation basically followed like this…. Me: I go to Bangkok on the Friday then? Sing: Yes. Very big show. Saturday night no good. Me: But I’ll miss two days of training AND I’m still fighting the following weekend. Sing: Mai pen rai (no problem). 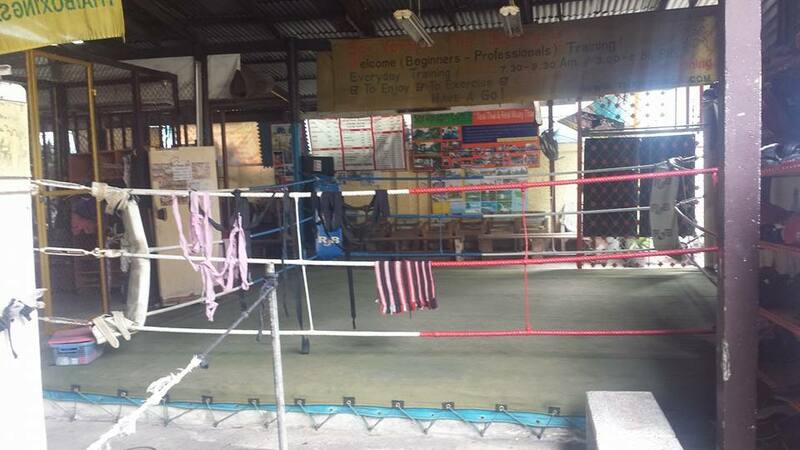 You train in Bangkok. Me: *standing like an idiot, gob smacked that he was letting me go*. What was the catch??? I immediately looked for tickets online to discover, the Friday night was a MASSIVE championship night. It now all made sense to me as to why I was being given a get out of jail free card. 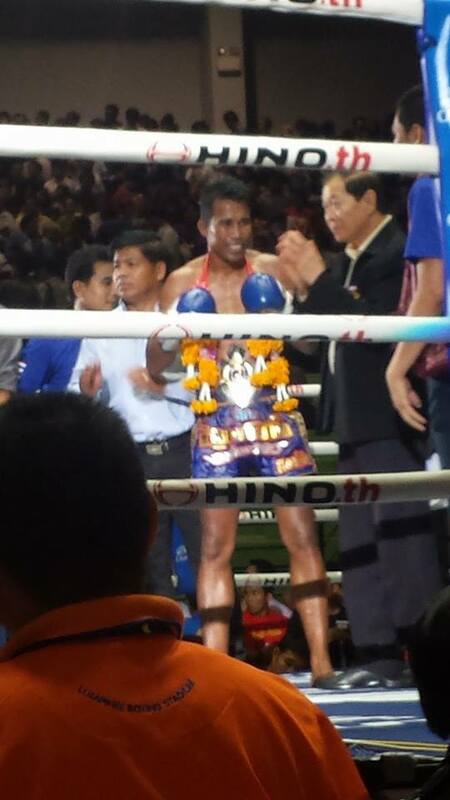 I am so grateful I got to be at Lumpinee for this particular fight night. 1 vacant title was up for grabs and 5 titles were being challenged. 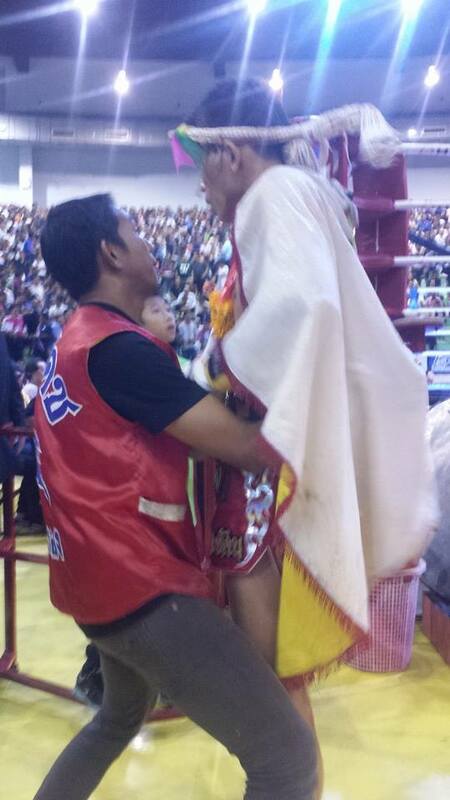 I was so excited to witness Muay Thai in all it’s beauty that I almost wore myself out with my own enthusiasm. I had booked our tickets online, trying to find decent seats which weren’t too far from the action. What I didn’t realise, is that I had managed to buy front row, ringside seats!!! The red corner walked directly past us as each fight progressed. I knew that Sing was going to be there for these fights, and it took about all of 3 minutes before I heard something screaming out my name. The greatest thing was that when I turned around, he was there with my old trainer Met! It felt like a lifetime since I had seen him. I went and said a quick hello and returned to my seat. The next time I turned around the catch a glimpse, there was Sak! Sak was my original trainer at Sinbi who has recently been moved to Hong Kong for a year for work. We had an absolute love hate relationship when we were at the gym but I’ve always had a soft spot for him and couldn’t believe how happy I was to see him (and that he was in Thailand when he was supposed to be in Hong Kong). The stadium was indescribable. The atmosphere was like nothing I had ever experienced in my life. 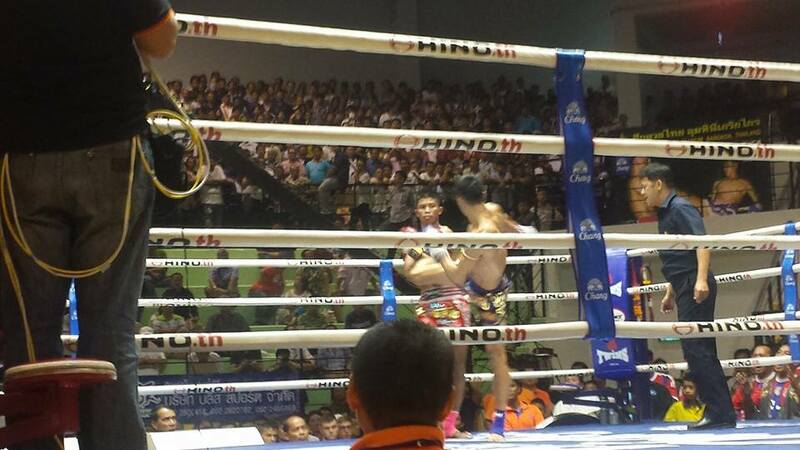 Even being at the MCG back home for and AFL finals game had nothing on what was going on in Lumpinee. The Thai only sections were packed to the brim and the betting was going mental. The sounds of the “oo-eees” echoed in unison through the entire stadium. It was impossible not to feel completely intoxicated by my surroundings and I could not stop smiling the entire time. The quality of the fights were beyond exceptional. Each title fight as good, if not better than the next. It was so inspiring to see the craft at it’s finest, and what is possible (for some). It was also amazing to see that every title fight had a south paw fighter. Amazing to watch!!! Only one guy lost his belt, in what was the most epic fight I saw that night. What I love about this sport is the respect that is given. How devastated you would be to lose your belt, but to show such respect and appreciation to your opponent. That’s what Muay Thai is all about. To cap it all off – we saw the King. That’s right. The King of Thailand!! 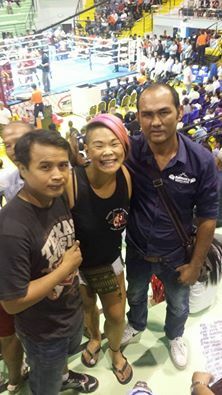 Just cruising around Lumpinee, having a photo with one of the victors. He was so close to us that he almost stepped on my friends foot. Many people say they have never seen the King. Especially down here in Rawai, a lot of the Thai people have never physically seen him. It was a shame some drunk foreigner didn’t know who he was and stumbled over and almost knocked the King over!! Idiot! 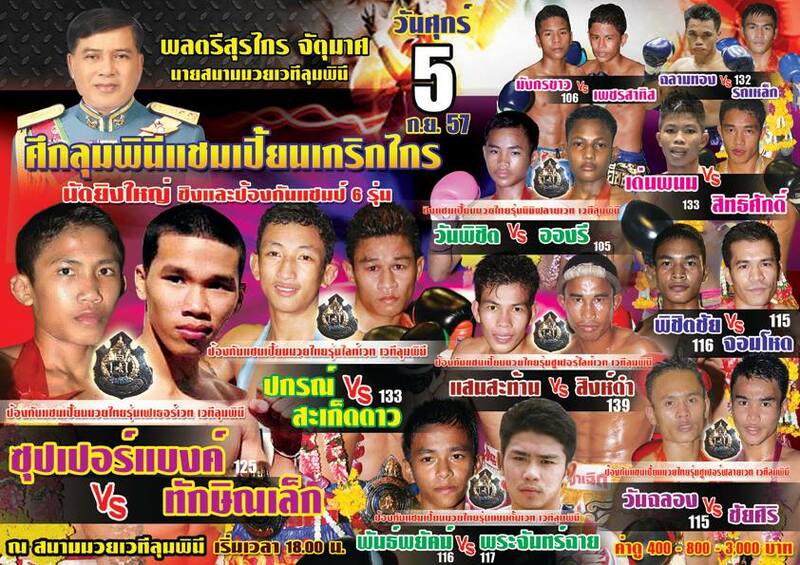 So – Championship night at Lumpinee. Awesome. Pure awesome. Next on the list was to find a gym to train at. Originally I was going to train at WPT with Met. Unfortunately after we booked our accommodation, I realised that Met’s gym was at least an hour cab ride away from our hotel and it was not time I had available to me, to be travelling to and fro. I quickly searched Google for gyms near my hotel and sure enough, came across Sor. Vorapin. I didn’t know anything about the gym, only what the website had told me. The session looked great, 3 hours, well structured. I was excited to get a taste of what the training in Bangkok would be like. I was a good little Nak Muay and went for a walk to find the place during the day. 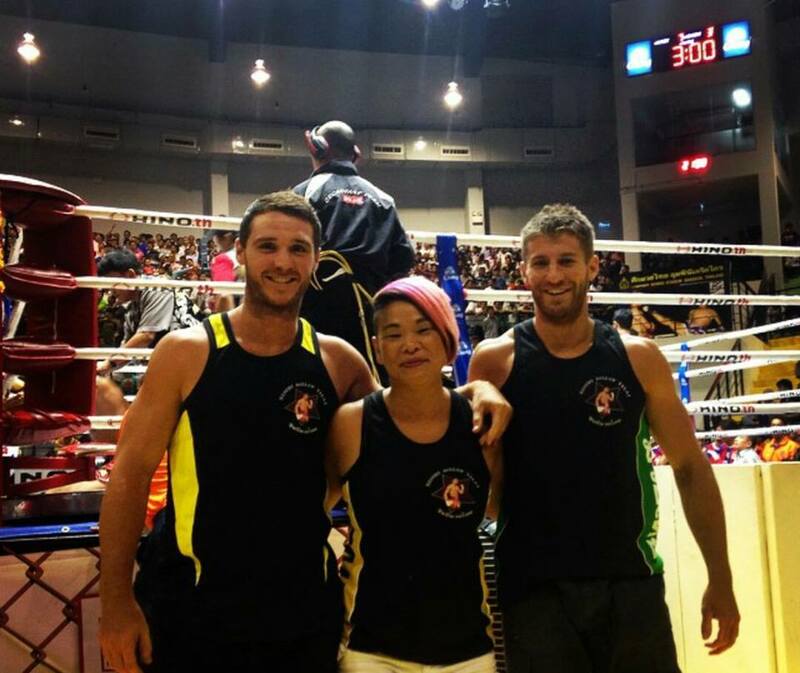 I wanted to make sure it was ok for me to train (given that some gyms are Thai only gyms and that I am a female) and that I would get some sparring and clinching in. I was assured it wasn’t a problem and happily continued on my way. The gym itself was down a random little alley way and was completely ghetto. Exactly what I had expected to find, and for some reason I thought this would mean the training would be good. Don’t ask me why that was my assumption. It was. And it was wrong. When I arrived at training I started warming up… I had noticed I was the only person there at this stage. The trainer instructed me to skip, which I attempted to do until I quickly realised the rope was so short it was hitting me in the back of the head. I’m not a very tall person so there was something wrong there. Lots of Thai ladies began to roll into the gym and one Thai guy. It was pretty clear that it was pretty much a Thai gym that allowed foreigners and I was immediately confused by the high number of Thai woman in the class. 11 women and 4 men. It took me about a minute into the “warm up” which somewhat resembled what I assume boxercise would be like and knew I had been placed in a beginners class. I immediately asked the owner/head trainer, who I believe was trying to reassure me (in Thai) that he could see I was not new and that he would take me on pads. My feelings of relief were short lived. I began to do my pad rounds (which were un-timed). It was basically him thrashing me cardio until I couldn’t breathe then giving me a break. I managed to do 6 rounds on pads, which weren’t consecutive, and weren’t all with the same trainer (????) Fortunately the second (and only other trainer there I might add) realised immediately that I was not a beginner. No one at the gym really spoke much English, which was great practice for me. I managed to have a conversation about me fighting – they had asked if I had fought before and told me I was very good and strong. The owner seemed super impressed and was really kind to me and wished me all the best. All in all, I would not go back to that gym, but once I let go of my expectations and accepted it for what it was, it was a little bit fun. I got some good cardio in and no one tried to mess with my technique (usually I wouldn’t mind, but a week before you fight, you really won’t change too much). The weekend was capped off with a beautiful dinner at River City and some extremely overpriced drinks at a very impressive bar in The Tower, followed by a relaxing day of sleeping in and eating some great food at MBK. Thanks to Nik and Hugh for letting me travel with you guys. The weekend would not have been as amazing without the two of you. It was nice to get away for a few days, to get some inspiration, and some much needed rest. I’m a little worse for wear again after my fight over the weekend – but more of that to come soon.